These are essays about election reforms. As Pennsylvania gained population from the 2000 to 2010 censuses we lost seats. Think about what that means for a moment in terms of a functional Democracy. The moment you need more representatives, they are taken away. If you live in a district – stay in your district. You already have a Congressional Seat. 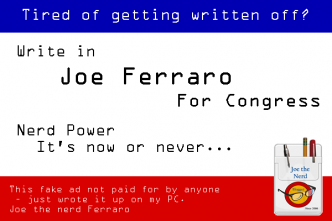 You want to run for Congress – by all means represent YOUR home town – not mine. You cannot create an unhackable election system. You certainly can not create one with the pittance of cash allocated to elections and personnel befuddled on the operations of the machines.